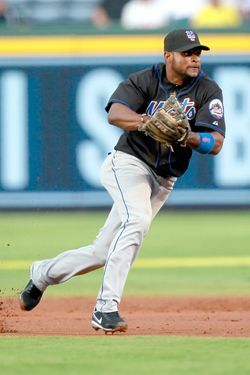 The Mets released Luis Castillo today, cutting ties with the second baseman whose contract had become a symbol of Omar Minaya's tenure as GM. (Faith and Fear in Flushing has already declared today "V-E-4 Day" in a headline.) The Mets, despite all their penny pinching this winter, will pay Castillo the $6 million he's owed for this season — the last of his four-year, $25 million contract — and if another team picks him up, that team would pay him just the minimum salary, with the Mets on the hook for the rest. "I don't think there's any question there is some linkage between his situation and a perception of the Mets that has existed to this point," Alderson said. "That's something that was taken into account. At some point you have to make an organizational decision, and it goes beyond just an ability to play and to not play. Those things are relevant, and you try not to make them so controlling that it dictates the final decision under any circumstances. But realistically, it's a factor." Of course, getting rid of Castillo isn't the hard part. Assembling the team going forward is. After all, like Oliver Perez and his bloated contact, Castillo would have been gone after this season ended anyway. Alderson's just speeding up the process. (Speaking of which, Perez's days could be numbered as well.) Still, the sooner the Mets can separate themselves from the last few years — or at least, from some of the better-known mistakes that they made over that time — the better off they'll be.